What car's second generation was better than the first? Successfully redesigning a car is no small task. While it's easy to come up with examples of vehicles that were great in their first generation and not so great in their second, this week we want to know what vehicle not only managed to avoid the sophomore slump, but was an actual improvement. What car's second generation was better than the first? A rare spring Mustang II sighting the other day on the cape that rust remembered got me thinking about second generation automotive disappointments. With apologies to Mustang II fans/owners, few would argue the second generation of Mustangs did justice to the iconic first generation. After seeing the Mustang II, I was able to easily come up with quite a few examples of second generation automobiles that fell short of the original models, but not nearly as many that improved upon them. This week's QOTW is concerned with finding examples of these improved second generation automobiles. 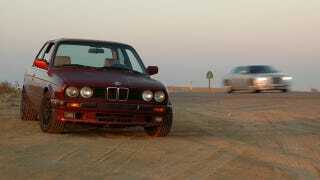 My answer for this question is the second generation (E30) 3 series BMW. As a former owner of a first generation (E21) 3 series, I can confidently say that improving upon the E21's design was not a given. Although they aren't the fastest things on earth, the tail happy, high revving little cars are a lot of fun. Having said that, the E30s improved on the E21s in almost every way possible. More reliable, faster, more fun to drive, disputing the second generation 3 series' superiority to the first is nearly impossible. Now that I've ruled out the fairly obvious E30 choice, tell me what's your pick for most improved auto in its second generation? What car's second generation was better than the first?